DESCRIPTION: Guide Price: £300,000 - £325,000. This unique detached property offers modern styling and contemporary design in the ever popular village of Rusthall. 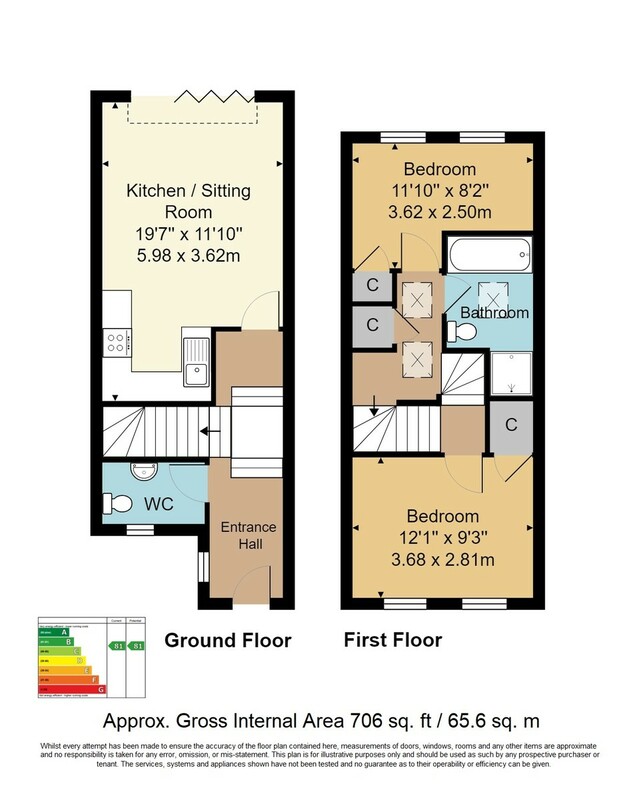 It offers an open plan living area, cloakroom and hallway on the ground floor with a vaulted ceiling landing and two bedrooms and bathroom on the first floor. There are bi-fold doors leading to a raised deck area overlooking the rear garden and valuable off road parking with its own driveway to the front. SITUATION: The property is situated in the village of Rusthall which has a good mix of independent retailers, with a popular school and immediate access to the pretty Rusthall Common. Beyond this, Tunbridge Wells itself has a far wider mix of social, retail and educational facilities including two theatres, multiple shopping opportunities at both North Farm Retail Park and the Royal Victoria Place Shopping Centre, alongside a host of independent retailers, restaurants and bars between the Pantiles and Mount Pleasant. Tunbridge Wells has two main line railway stations connecting to London termini and the south coast and there is the further availability of a commuting bus in the area (please speak to Wood & Pilcher staff for further details). HALLWAY: Stairs to first floor, double glazed window to side with colonial shutter, carpet, radiator. CLOAKROOM: Double glazed window to front with colonial shutter, low level WC, wash hand basin, tiled floor, radiator. LIVING AREA: A lovely open plan living area with kitchen comprising a range of wall and base units with complimentary wooden worktop, part tiling to walls, inset sink and drainer with mixer tap, built in fridge/freezer, oven, hob and extractor hood, free standing washer/dryer. The sitting area has bi-fold doors across the rear again with colonial shutters, radiator, carpet. FIRST FLOOR LANDING: An impressive vaulted ceiling with two remote controlled Velux windows. Built in store cupboard housing the gas central heating boiler. BEDROOM: A double bedroom with double glazed windows to front with colonial shutters, built in wardrobe, carpet, radiator. BEDROOM: A further double bedroom with double glazed windows to rear with colonial shutters, built in wardrobe, carpet, radiator. BATHROOM: A white suite with panelled bath, low level WC, pedestal wash hand basin, shower cubicle, heated towel rail, tiled flooring, part tiling to walls. Vaulted ceiling with remote controlled velux window. REAR GARDEN: A nice sized garden featuring raised deck areas, fencing to boundaries. TO THE FRONT: Rare for this area, there is a block paved driveway providing off road parking for one car.